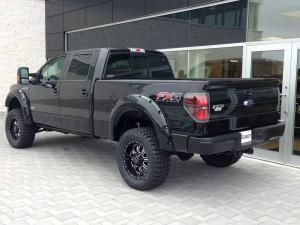 You want a custom truck in St. John’s without having to wait for weeks, and without risking your dealer warranty. You’ll get it right here at Cabot Ford Lincoln, the only authorized dealer in Newfoundland and Labrador for DSI Custom Vehicles and 4 Wheel Parts! You get their parts, their warranties, and their prices, all right here! 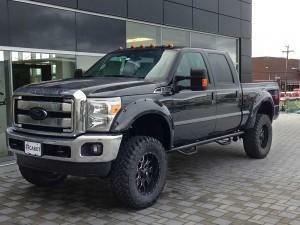 Dreaming of a truck modification but concerned what it might do to your warranty? Only Cabot Ford Lincoln offers a full range of mods all fully covered by the manufacturer’s warranty! And best of all, all parts, accessories, and customizations — including installation costs — can be financed at the dealership and included in your monthly vehicle payment. That means there is no big cash outlay at the time of purchase for your customization work! Don’t compromise your vehicle warranty by getting your work done elsewhere. 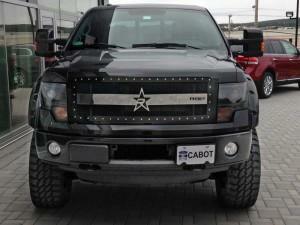 Cabot Ford Lincoln is the spot for custom truck accessories in St. John’s. Trust brand names like Roush, Truxedo, 4WD, Lexani, Goodyear, Warn, Bushwacker, Pro Comp, MagnaFlow, WeatherTech, DrawTite, BMF Wheels, Gibson, KC HiLites, extang, Lund, BF Goodrich, DeeZee, Hypertech, Elbach Springs, Fox, Putco, Smittybilt, Skyjacker, Precision, AMI, RBP, Wheel Pros, AVS, BAK, Rancho, PIAA, Husky, MHT, and many more! You keep all the original wheels, parts, and equipment that came off your vehicle. Plus, Cabot Ford Lincoln is the only place you’ll get it all done with absolutely no risk to your Ford warranty. You just can’t get that guarantee anywhere else! 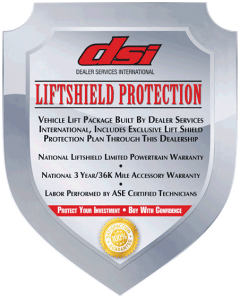 DSI warranties all of its parts, accessories, and labor against manufacturing defects and/or premature failure for 3 years/60,000 km, whichever occurs first from the “in-service” date of the vehicle. In short, should anything go wrong with any part or accessory supplied by DSI, we will replace that part or accessory free of charge. 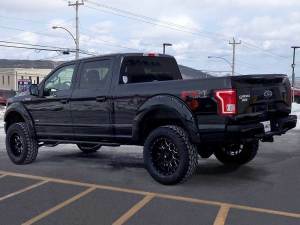 Ready to get your custom truck in St. John’s? Call Cabot Ford Lincoln now at 888-851-1662, drop us an email, or come in to our showroom at 177 Kenmount Road. It’s time to turn your dream truck into your dream come true! From the front bar and running boards up to the bug deflector and window deflectors, this custom truck makes a statement! 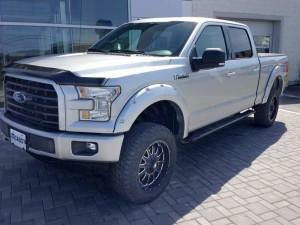 Your custom F-150 will look great outside, but don't forget WeatherTech mats to handle the dirt inside too! You'll light up the road with Snyper projector headlights and Snyper LED taillights on your custom truck. 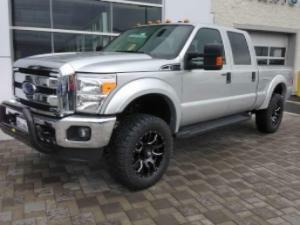 From the safari bar to the flared fenders, this custom F-250 will always get noticed. 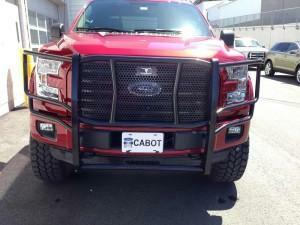 Cabot Ford Lincoln is the spot for custom truck accessories in St. John's! 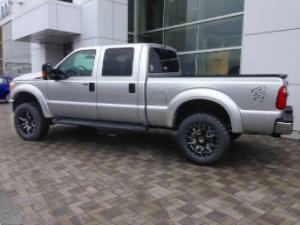 A set of LRG Rims and flared fenders on a Ford Super Duty... 4x4. Nuff said. 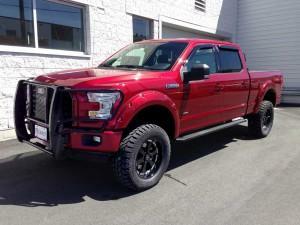 This fiery red F-150 will bring a smile to anyone who loves custom truck accessories! Grill guard, moose bumper, push bar, bull bar. No matter what you call it, we install it! 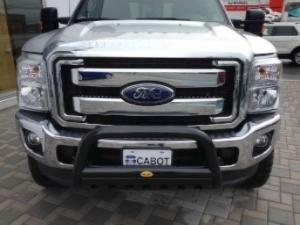 Cabot Ford Lincoln's got the custom truck accessories and brand names you're looking for. 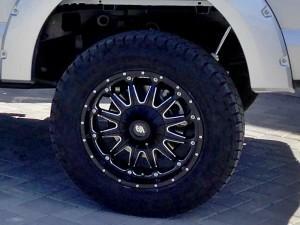 Customize your truck with 35" or 37" tires. 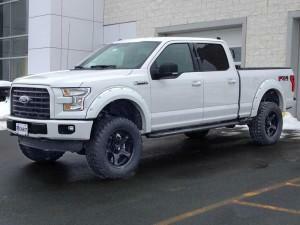 Whether you want a 4" or a 6" lift kit, we have what you need! 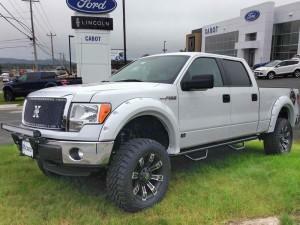 Cabot Ford Lincoln's custom trucks will make you king of the road! 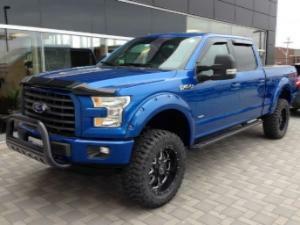 You haven't had a true off-roading experience until you've done it in a custom F-150! 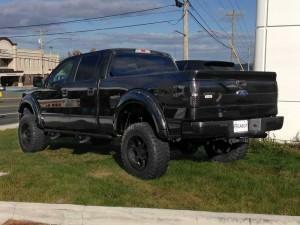 Outfit your custom truck with Pro Comp tires to charge through anything! 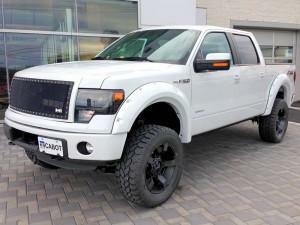 High-performance PICC lights and rugged safari bars will perfect the look of your custom truck. 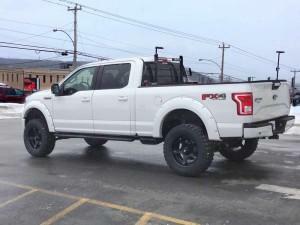 Pro Comp and Bushwacker are some of the most popular custom accessories in St. John's. 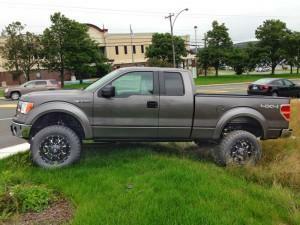 Always wanted a custom truck? 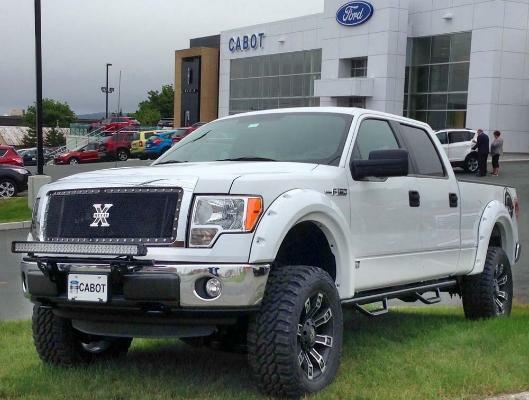 Cabot Ford has all the options and designs you've dreamed of. 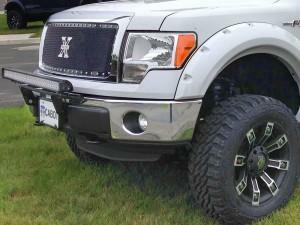 Black gloss tubular running boards can give your custom truck a look of rugged sophistication. 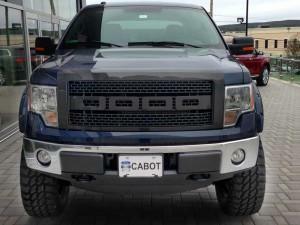 Cabot Ford Lincoln is home to the best custom trucks in St. John's. 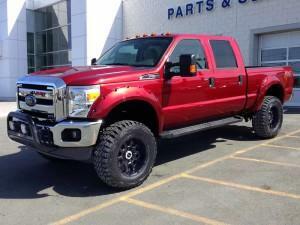 Come in to Cabot Ford Lincoln and drive out in the best custom truck in Newfoundland and Labrador! Turn some heads and win some hearts with HID headlights on your F-150. 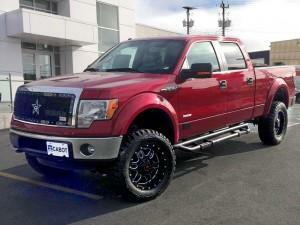 RBP grills and wheels on your custom truck will definitely turn heads! Finish off the look of your custom truck with a Boss grille. 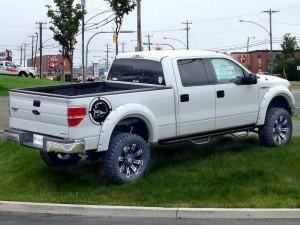 Lift kits are popular features for custom trucks in St. John's. 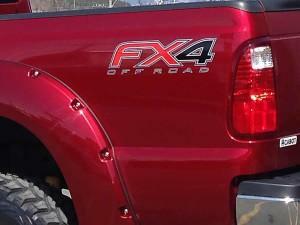 With an LED light bar on your custom truck, you won't miss any details on the streets of St. John's! 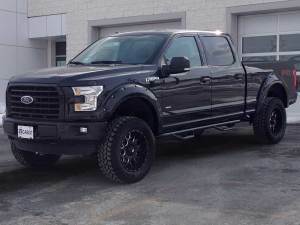 In Newfoundland and Labrador there's only one place to get this range of custom truck accessories installed while still keeping your full Ford warranty. 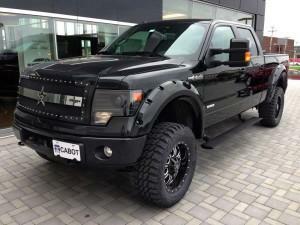 With 20" Fuel wheels and an M1 mesh grill, your custom truck will be both rugged and stunning! 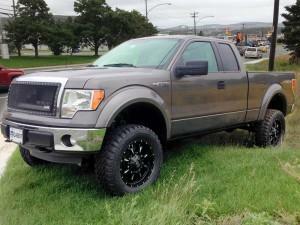 Add Pro Comp shocks to your custom F-150. Offroading will never be the same! 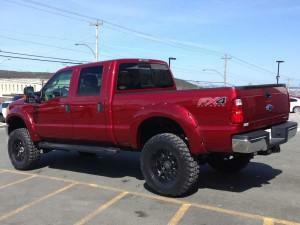 Owning a custom truck in St. John's is easier than you think! 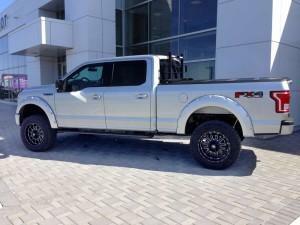 Dreaming of power-deployable running boards on your custom truck? Yeah we can do that! 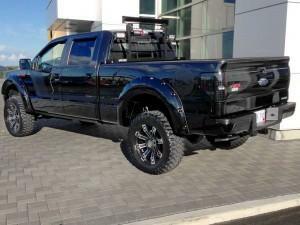 Your F-150 is begging for 20" Metal Mulisha rims and Mickey Thompson MT mud terrain tires! Custom grills are one of the most popular features on our trucks. 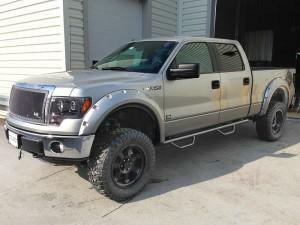 RBP grills and tubular running boards are two of the popular custom truck accessories. 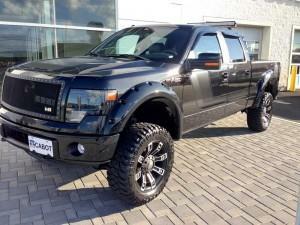 Customize a brand new F-150 at Cabot Ford Lincoln and keep your full Ford warranty! 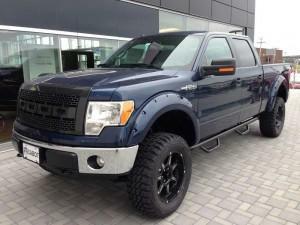 You'll turn heads when cruising around St. John's in a custom Ford truck! Choosing between fog lights, auxiliary lights, off-road lights, HID lights, or LED lights is tough! 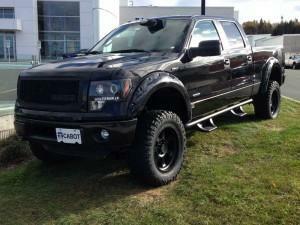 We help make your truck customization decisions easier. 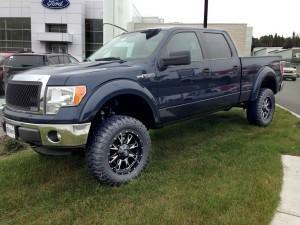 Toyo Open Country tires and Nitto tires are top of the line options for your custom truck. 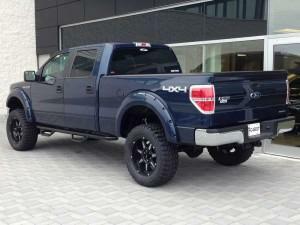 From luxurious to rugged, Cabot Ford Lincoln's got the truck accessories you need. 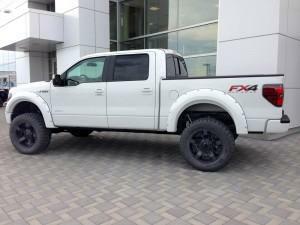 No matter which lift kit or running boards you choose, your custom truck will wow all other drivers! WeatherTech mats in the cab of your custom F-150 can handle the dirt and still look great!